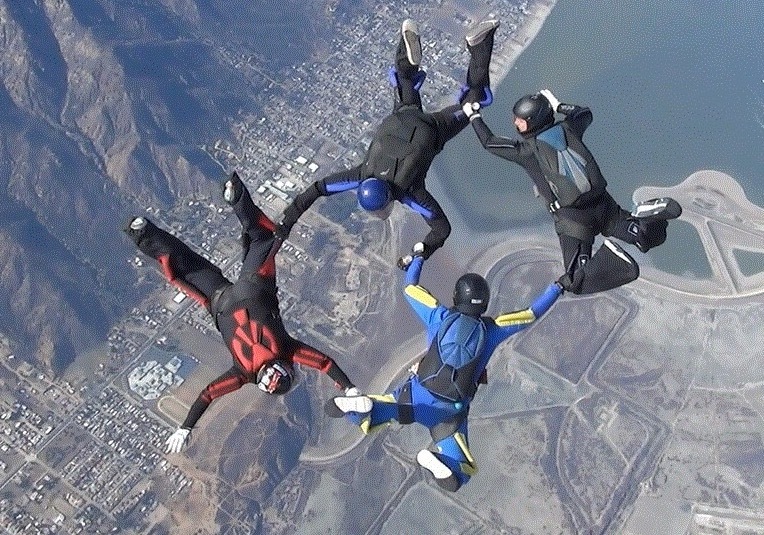 Skydive Elsinore offers load organizing for RW jumpers every weekend and on busy weekdays. The load organizers will plan the jumps for everyone’s fun, safety and success. What does this coaching get me? This program is designed for those seeking dedicated one-on-one formation skydiving coaching. It is ideal for everyone, from those who have just earned their A-license to those with thousands of jumps who need to brush up on their belly skills to earn their AFF-I Rating. A building is only as strong as its foundation, so you will be working on the basic building blocks of formation skydiving: skill by skill, jump by jump, until you are flying effortlessly in the air. Phase 1: The first 10 jumps are highly focused on body position, taking grips, forward/backward movement, fall rate control, center turns, basic RW exits, and breakoff safety. Can we work together in the tunnel? I’ve heard about EXCEL camps. How is this different? We are very proud of the EXCEL program, and we know that some of our EXCEL jumpers want (and need) undivided attention from a coach. EXCEL is designed to help new skydivers establish a path in the sport, but they do not facilitate individualized coaching. This program is for those who would like a dedicated one-on-one coach to monitor and tailor his or her skydiving education and prepare novice jumpers for excellence! How much does this kind of coaching cost? Skydive Elsinore is committed to thorough coaching with undivided attention. The best way to build your skills is to commit to a coaching program and execute the jumps over the course of a few days. We sell coaching packages in blocks of 10 jumps. Both phases of the Elevate Program have a very specific focus on individual skills, working on the building blocks of excellent flying. Each jump includes your slot on the aircraft, your coach’s slot, coach’s fee and a thorough debrief with a coach POV video. If you’re unsure about committing to a 10-jump package, you can buy a single coach jump for $90 to get your feet wet and see how it all works.